This week hasn't been a very productive one, since I caught a bad cold and was in bed most of the time. Only today I made a new necklace, that I decided to call Mori (or "forest", in Japanese). 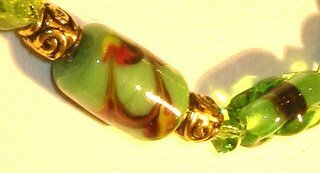 It is all in shades of green, main bead being a wooden one with some strass glued to it, and, most importantly, more Japanese porcelain beads (round and tubular ones), green with a feather pattern. The Mori is apparently a chaotic piece. It is definitely symmetrical, but uses several kinds of material and beads, thus its "desorganised" appearance at first. I tried to depict how a real forest feels like: there is a harmonic chaos into it, or at least that's how I feel it. 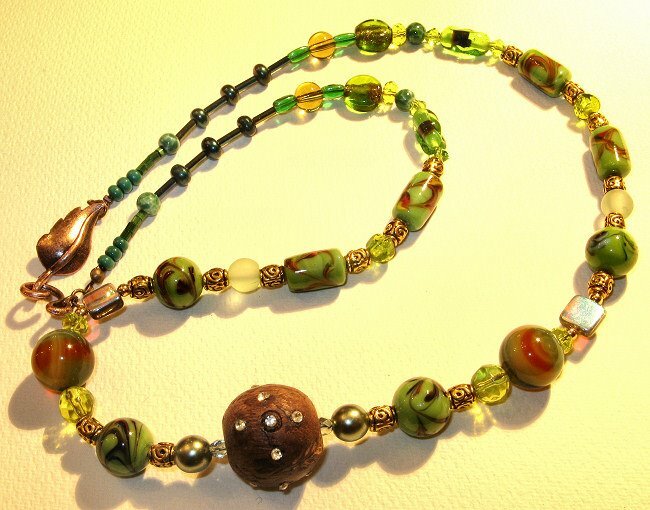 A mix of birds (the feathers in the Japanese beads), different woods of course (the focal bead), different shades of green, moss, crystals, sediments, even gold, as well as seeds and bugle beads. The light of the sun refracts through the Czech and some few Swarovski crystals. 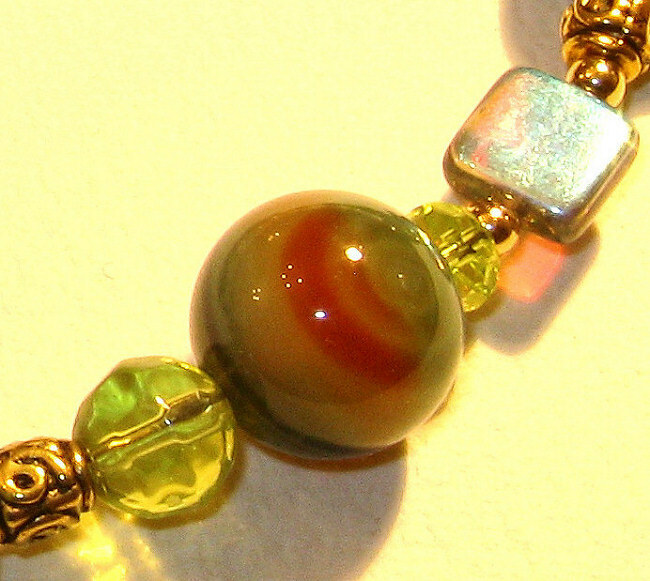 The moss is represented by two round agate beads (orange, brown, black and green swirls). The leaves and resins are all the different beads and their variegated shades of green, as well as the lovely copper clasp. I have also used antiqued gold spacers, fresh water dark green pearls and two powder green Swarovski pearls. Mori also has a smell, the smell of my beloved Mori No Sei (Spirit of the Forest), an old scent by Kanebo, which is woody, resinous and fresh - probably smelling like an old and dark Japanese pine forest would! 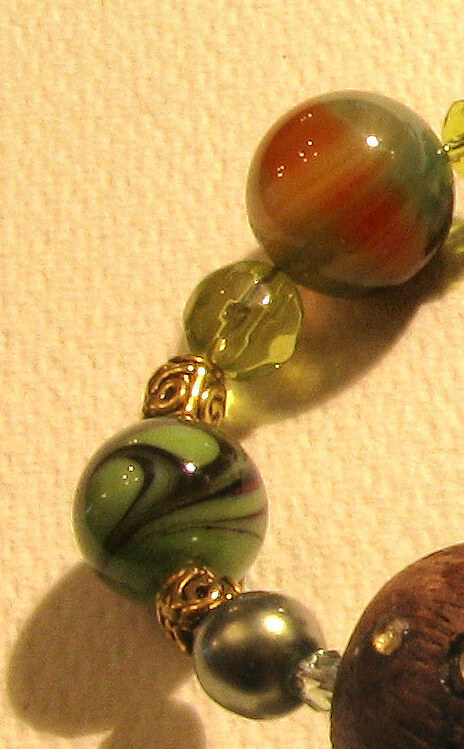 Details of the green agate beads, Czech Crystals and antique gold spacers. At the right-hand side you can see one of the round Japanese beads and Swarovski pearl. Above, detailed view of one of the Japanese tubular beads, along with the spacers and Czech crystal bead in green and black. 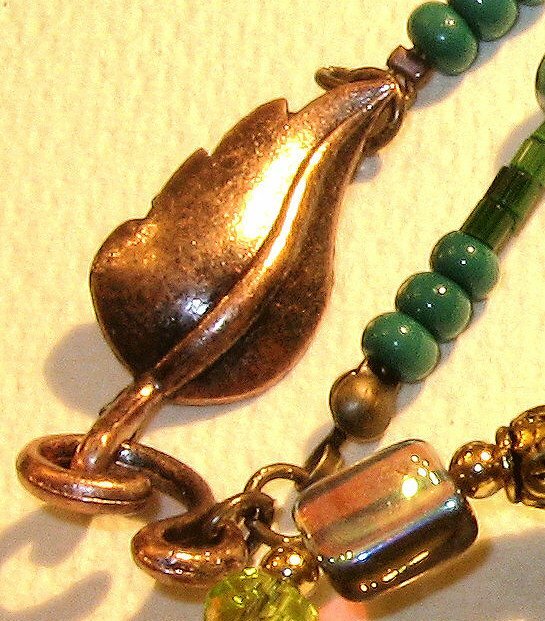 A detail of the clasp in antiqued copper and in the shape of a leaf, along with some of the Czech crystal seeds and beads.